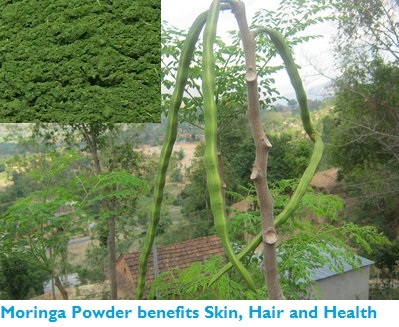 Moringa powder is obtained from the leaves of Moringa olifera tree. These leaves are dried at low temperatures and then powdered. All impurities are removed from this powder and then they are made into capsules. This powder in the capsule remains fresh for many months. The dried form is considered more nutritious than the fresh leaves. It is pure and organic and do not cause any side effects. It is rich in antioxidants and has Vitamin A, Vitamin C, Vitamin E and bioflavonoid in large concentrations. Active oxygen radicals take electrons from healthy tissues and cause skin diseases. The antioxidants help in preventing active oxygen from oxidizing healthy tissues. As a result the ageing process is delayed and your skin is protected from fine lines and wrinkles. If you wish to have a glowing skin that is smooth and blemish free, use moringa powder as a face pack. You can also mix it with fuller’s earth and put it on the face. Let the pack stay on your face for about 20 minutes and then rinse off with water. If you apply this powder on wounds and cuts, they will be healed fast and the skin will not show any wound marks. The hair follicles need good supply of oxygen and nutrients to make the hair grow properly. Vitamin A present in moringa powder helps in healthy hair growth. Along with zinc, it prevents drying and blocking of sebaceous gland and ensures that adequate sebum is secreted by the gland. Vitamin A deficiency leads to dry hair, thickening of he scalp and dandruff. Moringa powder contains certain vitamins, amino acids and minerals that take n active part in metabolic pathways concerned with the formation of keratin protein. Keratin protein, as you know, it essential for making your hair healthy. The amino acid methionine present in moringa powder provides sulphur to the hair and thus helps in preventing hair loss. Moringa powder is a rich source of vitamins. B vitamins, especially B6, biotin, folic acid and inositol, help in preventing hair loss. Vitamin C and E increases the circulation of blood in the scalp and aid in supplying more nutrients to the hair follicles. This in turn helps in better hair growth. Vitamin C is needed for the maintenance of capillaries carrying blood to the hair follicles. Zinc present in moringa powder helps in enhancing hair growth ad reducing hair fall. Moringa powder has high contents of antioxidants that help in preventing the growth of cells that cause cancer. Moringa powder is a rich source of vitamins, antioxidants, minerals and phytonutrients and therefore very beneficial in enhancing your energy level, stamina and in improving your concentration. So it is good for students to improve their concentration and for athletes to increase their stamina when do the workout. It also helps in losing your weight as consuming it provides you enough energy and make you active so that you need not eat more to increase your energy. Moringa capsules or drinks made from its powder are a natural home remedies for controlling diabetes. If you consume it regularly, you can reduce the level of sugar in your blood. Moringa powder had soothing properties and therefore it is great for calming you down and lowering the blood pressure. Consuming it regularly provides you sound sleep and refreshes you. It is also good for treating insomnia as it has the ability to treat certain sleep disorders. The detoxifying properties of moringa powder make it an excellent choice for purifying water. Its coagulant properties make it attach with harmful bacteria and other substances in water. Similarly, when you consume moringa powder, it helps in removing toxins from the body. Pregnant women and breast feeding mothers are more likely to suffer from low nutrition than other women. So they are advised to consume moringa powder to solve this problem. By consuming 6 spoons of moringa powder per day, they will get all the iron and calcium that they require during their pregnancy and breast feeding periods. Moringa powder is good for improving your immunity system and protecting your body from various infections and diseases. It also nourishes your eyes and the brain, enhances metabolism and improves the functioning of the cells. It is also good to improve the functioning of your liver and the kidney. Moringa powder is effective in lowering the level of cholesterol in the body and thus protects your body from various heart diseases. It helps in reducing LDL cholesterol, which is bad for your body and ensures that your heart remains healthy. It also has the ability to prevent occurrence of blood clots..
Moringa powder is 100 % organic in nature and you will not suffer from any side effects by consuming it. It can be used for people of all age groups and does not cause any problem at all. In Africa, babies suffering as a result of low nutrition are given this powder to treat them from the effects of malnutrition. If you are suffering from depression or anxiety,, add moringa powder in your daily diet and you will soon get relief from these symptoms and become energetic. You will start getting positive results within two or three days of consuming it. Moringa powder had medicinal qualities and therefore it is good in treating minor infections caused by bacteria and fungi. It is also good for treating anemia, reducing the blood sugar level in the body and for reducing your weight. If Moringa powder thickens the blood, is there not a danger of it causing a blood clot, or thrombosis? You mentioned that if you wish to have a glowing skin that is smooth and blemish free, use moringa powder as a face pack. My wife has been wanting some products so she can have a spa party with her friends. Are there specific ways to use this powder for a face pack? Ordering some of this moringa powder might be a good idea. Thank you so much this is very helpful. My daughter is 6 yrs old and she is very under weight for her age. I want to start giving her moringa powder to boost her vitamins and mineral intake. Can you tell me the dose for 6 yrs old?